Contributor Ozzy0512 created this beautiful drone video of the Turkish Aegean Sea coast in the area of Bodrum. Bodrum, which is part of the Muğla Province of southwestern Turkey, is home to some of Turkey's greatest cultural treasurers. The area has been inhabited for many millennia and was the site of the Tomb of Mausolus, one of the Seven Wonders of the Ancient World. Nowadays, Bodrum is probably at least as well known being home to some of the world's best sailing waters. 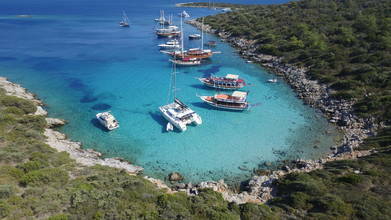 Description: Bodrum bays, coves and island.